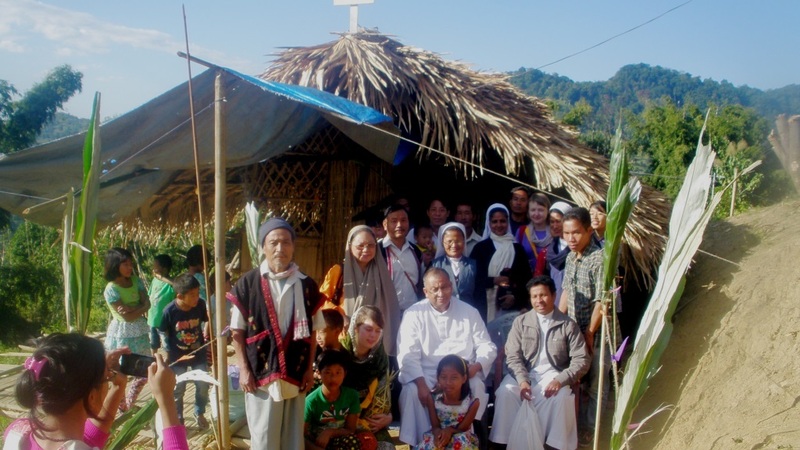 Lamlo Village, a small Tutsa community in Tirap District was very happy to have a new church blessed in their midst by Bishop George Pallipparambil SDn on 26th November. Immediately after the conclusion of Year of Faith, a humble Church was blessed to strengthen the faith od this new Catholic Community. Many people from Deomali were present for the blessing and the function that followed it. The Church was small and so many had to stand outside during the Holy Mass, presided over by the Bishop and concelebrated by Frs. Linus and Francis. The Church was was inaugurated by Miss Maria and Miss Dorothey from Poland, cutting the ribbon together, accompanied by loud applause from the people gathered. Bishop George in his homily stressed the need to be vigilant and careful about what they hear and see. Frs. Linus Jamuda and Francis Kurian togther with Sisters Shiny MSMHC, Pauline Narzary MSMHC and Cecilia Ekka MSMHC prepared everything well for the day.